Two of the biggest decisions you’ll make as an RVer are choosing your camper and selecting campsites. There is an endless array of options, and there are benefits and downsides to each. Do you want to be a minimalist and live in a camper that just meets your needs regarding space and comfort? Do you lean more towards the “glamping” style of camping, and need a hot shower and in-house laundry to feel comfortable? Or, maybe you’re excited about buying a vintage 1960s trailer and fixing it up? Your lifestyle, flexibility, and budget are key determining factors that will influence the type of camper and campsites that feel right for you. Let’s take a look at your options. The term “recreational vehicle” is broad, but it encompasses two main categories: motorhomes and travel trailers. Class A motorhomes are as big as they come. These are the giant “tour buses” that you see barreling down the highway. They’re expensive (ranging from $75,000 to $1 million or more), comfortable, and often have all the amenities (including a washer and dryer) that you’d find at home. Class A motorhomes are generally 26 to 45 feet long. One of the biggest benefits of Class A motorhomes is comfort. These motorhomes can have multiple bedrooms, tons of slide-outs for extra space, a full-sized kitchen, a living room with a fireplace – you get the idea. When you’re inside a Class A, you don’t feel like you’ve left home at all. Some custom Class As resemble a penthouse suite at a posh hotel. There’s also ample storage in a Class A. These rigs even have a “basement,” which will hold almost anything you think you would ever need on the road. One of the biggest downsides to Class A motorhomes is the price. Class As are extremely expensive, usually starting at $200,000 and going into the millions. They’re also challenging to drive and park; some states will require you to have a special license (such as a noncommercial Class B license) to drive one. You’re also limited as to where you can go. Because of their immense size, some RV campgrounds (and most state and national parks) can’t accommodate Class A motorhomes. Energy requirements are also a consideration. Class A motorhomes require a 50-amp hookup, while travel trailers only need 30 amps. You’re going to pay more per night for 50-amp campsites. Another challenge is that if you want a car to drive around town when you’re parked, you’re going to have to tow it (this is called a toad). Towing a car adds to the challenge of driving such a large bus down a busy road, as this can extend your length to 65 feet or more. You need to think carefully about maintenance with a Class A. Imagine breaking down on the side of a highway in one of these rigs. A big-rig tow truck will have to be called in to tow it to the mechanic, and many mechanics won’t work on Class A motorhomes because the engine is so challenging to access (they have to enter your “home” to access part of the engine). Safety is another issue with Class A motorhomes. They are particularly unsafe in front-end crashes, as there are no airbags and no engine to protect the driver and passenger (in a Class A, you’re driving above the engine). They’re also vulnerable to sway from high wind gusts. Class C motorhomes are the next size down (leaving Class B as the smallest in the motorhome category). Class C motorhomes have an engine and front end like a large truck, which makes them far less intimidating to drive than a Class A. Class Cs are typically 24 to 28 feet long, and cost $50,000 to $100,000. They’re the happy medium in motorhome options. One of the biggest advantages of Class C motorhomes is that they feel familiar. Again, the front of a Class C resembles a truck, and you’re much lower to the ground. This means they’re easier than the Class A to drive and park. Another benefit to Class C motorhomes is safety. In the event of a front-end crash, Class C motorhomes have an engine and airbags to protect the driver and passenger. Because they’re lower to the ground, they’re also less likely than a Class A to roll over, and less likely to be affected by strong wind gusts. Class C motorhomes are also easier to maintain. Most Class Cs have Ford, Chevy, or Mercedes motors, which means that most mechanics can easily work on the engine if it starts giving you trouble. Fuel efficiency isn’t great with Class Cs, but it’s still a bit better than a Class A. Class C motorhomes generally get 9 to 11 miles per gallon. You will get slightly better mileage (perhaps as high as 14 miles per gallon) if you’re not towing anything. Your gas mileage will also vary depending on the terrain. Class Cs have an overhead bed above the driver, and the couches fold out into beds. This means you can comfortably sleep six people or more, depending on the size you choose. This makes them an appealing option for families traveling with kids. 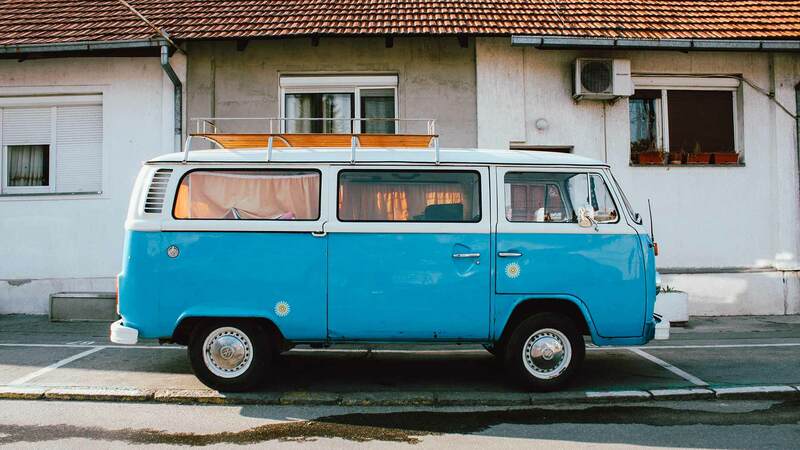 Remember the classic Volkswagen campers from the 1960s? These iconic campers were what made Class B motorhomes popular. Class Bs are basically large vans that have a bed, tiny kitchen, and seating area. Most of the newer Class Bs also have a toilet and shower. These vans have an elevated roof, so unless you’re over six feet, you will be able to comfortably stand up inside. Class Bs may be small, but they can also be luxurious, with interior wood paneling, lots of windows and skylights, stainless steel appliances, and an entertainment center. Don’t let their small size fool you – new Class Bs can get pricey, topping $150,000 or more. One of the biggest advantages of Class Bs is that they’re super easy to drive. This is especially advantageous when you’re in a city or driving up and down twisty mountain roads. They also get much better gas mileage than the other classes; generally, Class B vans get 18 to 25 miles per gallon. Their compact size also means you don’t have to tow another vehicle behind you. The biggest downside to a Class B is that they’re small. There is not much storage space, and sleeping options are limited. Two people can camp in a Class B comfortably, but more than that and you’re going to feel cramped. There is also a line of Class B motorhomes called “Super Bs” or “B+,” and these look more like Class Cs. Think of Class B+ as the love child between Class B and Class C. They’re still relatively small and easy to drive, but provide more living space than a regular Class B. When it comes to recreational vehicles, travel trailers are what you’ll most often see being pulled down the road. Travel trailers are towed separately from your vehicle and can be anywhere from 10 to 40 feet long. Like motorhomes, there are several different kinds of travel trailers. A conventional travel trailer is 12 to 35 feet long and can sleep up to 10 people. Most of the time, these trailers can be towed by any midsize SUV or truck. Smaller models can even be pulled by a minivan or car. Mid to large travel trailers have all the amenities you’d want away from home: beds, shower, toilet, kitchen, and living space. Most travel trailers will also come with optional slide-outs, which can add up to three feet to your interior space. 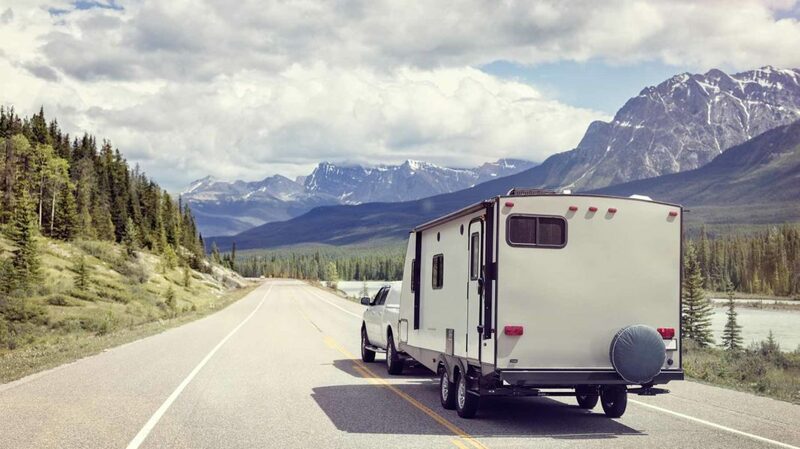 The biggest advantage of a conventional travel trailer is that you can detach your “living space” and use your vehicle for running errands and sightseeing. They’re also much less expensive than motorhomes (running $8,000 to $90,000), and you might not have to buy a special vehicle to tow one. This further cuts down on your investment. Another advantage of a conventional travel trailer is that if maintenance issues arise, you still have a vehicle to use while your trailer is being fixed. In a motorhome, both your vehicle and “home” are in the shop, which adds to the inconvenience of a breakdown if you don’t have a toad. It takes some practice to get used to towing a trailer. You don’t need a special license, but if you don’t have any experience then you will likely need some instruction on how to pull a trailer, and back one up, safely. When my husband and I were choosing an RV, we decided on the 16-foot CampLite UltraLite travel trailer. We wanted something high quality (it’s all aluminum), small, and easy to tow, but big enough to afford us a comfortable living space inside. We loved our CampLite, and it ended up being a great choice for us. However, it took months of research and looking closely at what was important to us before we arrived at our choice. Fifth wheel travel trailers are like conventional travel trailers but with one key difference: The front has a raised overhang, which extends over the bed of the towing vehicle; this provides a bi-level living area. Fifth wheels are generally 20 to 40 feet long and have to be towed by a heavy pickup truck equipped with a fifth wheel hitch, which is installed in the bed of the truck. Fifth wheels can cost anywhere from $20,000 to $160,000 or more. They can have up to four slide-outs, and some are very luxurious. Spaciousness and luxury are some of the biggest advantages to fifth wheels; they are the Class As of the travel trailer world. When you’re in one, you really do feel like you’re inside a home. Another advantage of fifth wheels is that they’re a great choice for families. There are often separate sleeping spaces for adults and children (often a master bedroom and bunks on the opposite end of the trailer). This can be a lifesaver for parents with children. Even though they look difficult to tow due to their height and length, many experienced RVers claim the opposite. The way they’re attached to the bed of the truck makes them easier to tow and park than a conventional travel trailer. A disadvantage of fifth wheels is the high price. Not only will you spend more on a fifth wheel, but you’ll have to invest in a reliable towing vehicle if you don’t already have one. Also, the fifth wheel hitch has to be professionally installed, which adds to the price. A pop-up is a tiny camper towed behind your car and resembles a large, flat box. When you get to your campsite, the top “pops up” and you have a functional, enclosed living space. Sleep bunks tip out from the sides, and you also have a tiny kitchenette, and maybe even a toilet and shower. Pop-up campers are extremely affordable; most run between $5,000 to $10,000, although this can go higher depending on the amenities you want. They’re also easy to tow and can be pulled by even a small car with a hitch. It’s easy to store a pop-up since they will fit into a small garage. Pop-ups can feel more like tent camping because the sides of the top half are made of heavy vinyl or canvas, with open window “screens,” just like a tent. However, you do get more protection from the elements because you have a hard roof. On the other hand, pop-ups aren’t insulated, and they can be difficult to keep warm when the temperature drops. Some pop-ups come with factory installed heaters, but others don’t. You can combat the cold with an electric or propane heater, but you’re still going to experience a lot of heat loss. The vinyl and canvas sides are also susceptible to decay, tears, and leaks. If you’re thinking about getting into the RV lifestyle, pop-ups make a great first step because they’re so affordable, especially if you buy one used. Weekend camping in a pop-up is an easy way to learn the ropes and figure out how you function living in a small environment. From there, you can slowly work your way up to larger setups. There are many vintage travel trailers that have almost cult-like followings: Airstream and Serro Scotty come immediately to mind. There’s been a huge resurgence in old travel trailers, as many people are renovating them and hitting the road full-time. You used to be able to get these old trailers for next to nothing. Now, however, a vintage Airstream on eBay will have hundreds of watchers, and the price can skyrocket at the end of bidding. 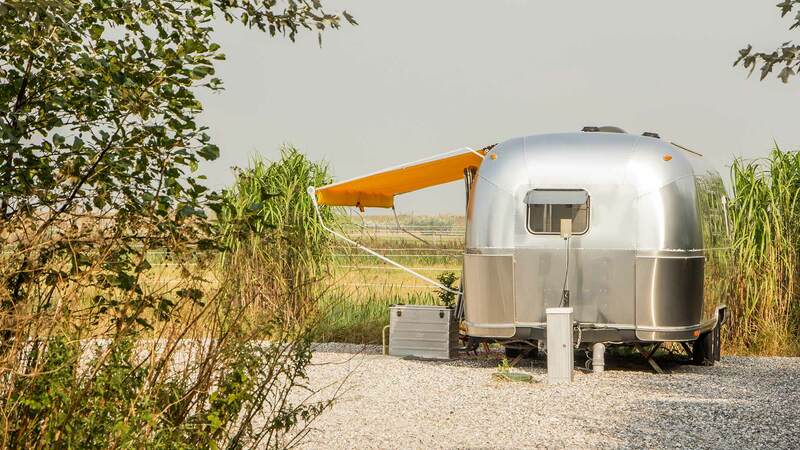 You can get lucky and find affordable vintage trailers, but keep in mind that renovations can get expensive. Aside from the “cool factor” (which, admittedly, can be hard to ignore), vintage travel trailers can be quite comfortable to live in full-time. When we were wintering in New Mexico, we met a woman living full-time in a 1969 Scotty. It was tiny, but she loved it dearly. It was the coolest looking camper we saw while we were on the road. Important Safety Consideration: Overall, travel trailers are considered a safer option than a motorhome for one key reason: When you’re driving, you’re doing so in your car or truck, a vehicle that has been subjected to thousands of crash tests and safety inspections. You are protected by front and side airbags, an interior rollover bar, and many other safety features. It’s illegal (and dangerous) to be in a travel trailer while it’s being towed. Motorhomes, in any class, are not required to go through any kind of crash testing. If you’ve ever seen a motorhome accident, then you know these vehicles can be literally blown apart by a crash. This is especially scary when you think that your family members might be on the couch, or in bed, when you’re driving down the road, with little to protect them in the event of an accident. With a travel trailer, everyone has to sit in the car or truck with you. This is much safer than moving about freely in a motorhome while you’re driving down the road. Before you start looking at campers, stop and think about these questions. If you want to explore a lot of big cities, then you might want to consider buying a smaller travel trailer or Class B motorhome. Driving a huge rig through unfamiliar streets in heavy traffic is not fun. If you’re more interested in exploring the open road, then a bigger setup will suit you fine. However, keep in mind that many state and national parks can’t accommodate large rigs. If you want to camp in these places, choose a motorhome or travel trailer that’s 32 to 35 feet or less in length. Think about what kind of camping you want to do. Are you more interested in spending time outdoors? If so, then a pop-up or Class B might be a good fit. If you want to carry the comforts of home with you, then a Class C or fifth wheel might work better. This is one of those questions that you won’t know the answer to until you get on the road. You might think you can get by with a small camper, only to find out later that you’d love a bigger setup with slide-outs. However, it’s helpful to head out to RV superstores (like Camping World) and go through dozens of different campers. They’re all laid out differently, with different storage solutions, and this is the best way to find a setup you’re excited about. How much you can afford to spend on a camper is going to be highly individualistic. But there are a few key points to keep in mind here. First, if you’re going to travel full-time, it’s important to remember that you’re purchasing a home for yourself. Most recreational vehicles are designed and built with “vacationers” in mind, which means they often don’t stand up to years of full-time travel and living. For example, the floors of many travel trailers are particleboard, which is susceptible to warping, rot, and mold. The interior walls, countertops, and cabinets are often made of cheap particle board or Formica, which can quickly peel and ding with the normal use of a full-timer (versus the occasional use of a vacationer). Slide-outs are another point of failure, especially if you’re constantly sliding them in and out every few days. This is a big reason why we chose a CampLite; it’s 100% aluminum, so it will last forever. More expensive travel trailers, like Airstream, also use higher quality materials on the inside. Yes, you have to stay within your budget, but it might be worth it to go with a smaller setup if it means you can afford a better quality “home” that will last. How Comfortable Are You Pulling a Camper? It takes time and experience to get used to pulling a large trailer. Even small trailers take some adjustment, especially when it comes to parking and backing up. The same is true with larger motorhomes. If you don’t feel comfortable hauling, or driving, a large rig, but this is the best fit for your family, keep in mind that there are RV driving schools, such as RV School, that will teach you how to drive safely. When you imagine camping in your RV, what comes to mind? Some dream of spending a week at an idyllic, peaceful campsite without another soul in sight. Some crave the hustle and bustle of a busy RV park, teeming with future friends and long conversations over a campfire. Others see RVing as the perfect family vacation idea, and simply want a fun and affordable place to stay with their kids for a few days. There are endless overnight camping options available. Some, such as RV resorts, can be quite expensive, while others, such as boondocking on public land, are completely free. So, how do you find the perfect place to stay? Let’s take a look at where you can stay in your RV, and how to find the best campsites. RV Parks are privately owned “campgrounds” that specifically cater to RVers. Some RV campgrounds might have a few spaces for tent or car camping, but most will be for trailers and motorhomes. At RV parks, most campsites will have either full or partial hookups. Full hookups mean that you have access to unlimited water, electric, and sewage services. Partial hookups mean that sewage is not included (although there is always a dump station on-site where you can dispose of waste). One of the benefits of RV parks is that most of the time, they’re fairly easy to get in and out of, and they’re often located near major highways. They also offer other amenities, such as on-site laundry and free Wi-Fi. Some large RV resorts, especially those near popular tourist attractions, provide games rooms and planned activities for children, and might have amenities like miniature golf, hiking trails, horseback riding, kayak rentals, or a pool. One downside of RV parks is that they’re often crowded, especially on summer weekends. RV parks located near popular U.S. cities can be very busy during peak vacation season. There is often little room between campsites, which means your rig is sometimes only a few feet away from someone else’s. You can find almost any RV Park, and make a reservation, through Reserve America. But before you reserve any campsite, head over to RV Park Reviews. It’s always a good idea to check what other users have to say about a campground before you make a reservation. You can also purchase the AllStays app for $9.99. This app is incredibly useful for finding campsites, from RV parks to state rec areas, and even boondocking opportunities. It also lists other information vital to RVers, such as elevation of campsites, incline, user reviews for each campground, amenities, and much more. It’s expensive for an app, but it is worth the investment if you’re traveling frequently. Additionally, you can find RV parks by joining clubs like Escapees, Good Sam, or Passport America. While these clubs do have annual membership fees (ranging from $25 to $45), they offer significant discounts – some as high as 50% – on thousands of campgrounds across the country. A few nights at a campground within the network can pay for your membership fee. When my husband and I were full-timing, we quickly learned that public parks were our first choice for camping. We loved the solitude and beauty of these parks, and our most memorable stays were on state and federally owned land. You can find any national park through the National Park Service’s website. Keep in mind that you have to make a reservation to stay in any national park. This can be done through their website, or by calling (877) 444-6777. You can also find state parks by visiting StateParks.com, which has a comprehensive list of parks organized by each state. Costs vary widely between national parks, and even between campgrounds within the same park. For example, Great Smokey Mountain National Park has many campgrounds that will accommodate RVs, and prices range from $14 to $23 per night. If you plan to visit several national parks, then it’s worth it to purchase their $80 Annual Pass, which covers your entrance fee into every park. Seniors (62 and older) can purchase a pass for $10 and get up to a 50% discount on camping fees. U.S. Military members and their dependents qualify for a free Annual Pass. The Annual Pass also gets you into other agency parks, such as those run by the U.S. Forest Service, U.S. Fish and Wildlife Service, Bureau of Land Management, Bureau of Reclamation, and U.S. Army Corps of Engineers. State park costs also run the gamut, depending on which state you’re in, what time of year it is, and how great the campsite is. During peak season, plan on paying anywhere from $20 to $45 for a prime campsite in a popular park with partial or full hookups. Some states also tack on a reservation fee, which can be as high as $9. However, there are ways to cut costs. When my husband and I were traveling, we purchased a New Mexico State Annual Camping Pass for $225 (residents pay $180). But with the pass, you pay only $4 per night for partial hookup campsites (full hookup sites are $8). We spent six weeks traveling around New Mexico because of this Annual Pass, and it more than paid for itself. Many people don’t know that the Corps of Engineers (COE) has parks and campgrounds in every state. These campgrounds are hidden gems: They’re beautiful, they’re not as crowded as many state and national parks, and they’re often less expensive (or even free). COE parks are tricky to find, which might explain why so many people don’t know they exist. When my husband and I were on the road, we relied on “Camping with the Corps of Engineers,” a reference book that lists every COE campground in the country. This book is probably the fastest and easiest way to find campgrounds, especially if your Internet signal is slow or nonexistent. We did find a few of the GPS coordinates in the book to be incorrect, but a quick phone call to the park got us back on track. Ultimate Campgrounds is a useful resource for finding public lands in the U.S. and Canada. They are the largest directory of public campgrounds on the Internet, with over 31,000 campgrounds listed. They include state and national parks, along with COE, Bureau of Land Management, and all other state and federally owned parks. Another option is to check RV-Camping.org, which lists campgrounds by each state and includes listings for Corps of Engineers parks. You can also find COE campgrounds by using Google Maps. COE campgrounds are almost always located near a water source, usually a lake or dam, so start your search there. You can make a reservation for a COE campsite by calling each park individually. Alternatively, you can call 1.877.444.6777 or visit recreation.gov. Boondocking, also called “dry camping” or “dispersed camping,” is when you camp anywhere outside of a dedicated campground. This can mean staying overnight at a Pilot Travel Center on the side of the highway, camping in the Arizona desert without a soul in sight, and everything in between. The options for boondocking are endless. So, where do you start? Generally, you can boondock on any federally owned land, provided you follow the rules, which vary depending on the park or agency. For example, most parks will not allow you to camp within 300 feet of a water source, but most parks will allow you to boondock for up to 14 consecutive days (or longer). You’ll have to move to another campsite several miles away if you want to stay in the area though. Most national parks do not allow overnight boondocking. They want to limit the land impact and ask that you stay at a dedicated campground area. Some high-use sites owned through the Bureau of Land Management will also restrict overnight boondocking to limit impact. However, there are still thousands of parks and lands throughout the country where you can boondock legally. It’s challenging to know what each park or agency will allow, and what they won’t, because they’re all different. You’ll need to check with each office before you get there to find out what’s legal. If you want to boondock on U.S. Forest Service lands, read up on their Travel Management and Off-Highway Vehicle Program, which lists the laws and guidelines by state and park. FreeCampsites.net provides interactive maps that allow you to quickly search for free campsites. Other users provide valuable feedback about sites they’ve discovered, which can help you make an informed decision. You can also purchase a topographical map (by state) and look at the land itself. Or, use Google Maps: Turn on terrain mode to make sure the roads are accessible for your rig. Finding boondocking opportunities on federal and state lands sometimes takes a bit of legwork, but that’s all part of the adventure. Most of the time, the little bit of extra exploring you have to do is well worth the effort. You can also boondock on privately owned farm and ranch land, provided you ask permission first. You might be surprised at how often people will say yes if you ask politely. One way to find privately owned boondocking sites is through Boondockers Welcome, which has hundreds of listings from private owners (most of them RVers themselves) who welcome boondockers. Harvest Hosts is a membership site that lists hundreds of unique boondocking opportunities at wineries, farms, ranches, and museums. You can also find some great campsites simply by talking to the locals. Strike up a conversation with someone at a diner or coffee shop. Their interest might be piqued when they hear your story, and chances are they know at least one hidden spot they might be willing to share with you. Many large retailers allow boondocking in their parking lots for a night. While a retail parking lot isn’t the “ideal” camping spot, boondocking while you’re en route to another location is a huge time and money saver. 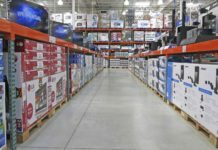 Keep in mind that other big box stores, such as Lowe’s and Home Depot, have allowed overnight parking but don’t generally have an “All Campers Welcome” policy like Walmart does. These stores might be options for a quick overnight stay – if you ask permission first. When you’re boondocking at a retail location, keep in mind that there is a code of conduct. Always check with the store manager that it’s OK to stay overnight. While most of these retailers have a welcoming policy toward campers, some stores will be located in towns and cities where overnight camping is not allowed. It’s always safer (and more polite) to ask first. When you pull in for the night, please be discreet and respectful. Don’t pull out your lawn chairs and down a few drinks outside. Retailers offer free overnight parking as a courtesy, so it’s best to treat it as such. When you can, repay the courtesy by shopping at these locations. Get some gas or groceries, and make sure your “campsite” is as clean – or cleaner – than you found it. It’s important to know that you’re never going to find the “perfect” RV. It doesn’t exist. No matter what, you’re going to have to give up some needs or wants to satisfy others that are more important. This is why it’s essential to make a list of the wants and needs that you’re not willing to give up, as well as the ones you feel more flexible about. One of the most exciting aspects of living and traveling in an RV is that you never know what’s going to happen when you pull up to a new campsite. You might meet a lifelong friend at the RV park you’re staying at, or you might have a life-changing experience while boondocking near a pristine mountain stream in Colorado. It’s all part of the adventure. Do you own a motorhome or travel trailer? What are your favorite places to stay while you’re on the road?